Cast members rehearse for the upcoming performance of "Legally Blonde the Musical" at Vista Murrieta High School. The "Nation's Most Spirited High School's" award-winning Drama Department at Vista Murrieta High School, A C.L.A.S.S. ACT, will present "Legally Blonde the Musical" at 7 p.m. on Feb. 14, 15, 16, 22, 23, and 24. All performances are in the school’s Performing Arts Center. Vista Murrieta High School is located at 28251 Clinton Keith Road, Murrieta. "Legally Blonde the Musical" is based off of the 2001 movie "Legally Blonde", starring Reese Witherspoon as the lead character, Elle Woods. Elle is a seemingly ditzy but surprisingly intelligent UCLA sorority girl who is madly in love with her boyfriend, Warner. When Warner dumps her, claiming he needs a more serious relationship, Elle follows him to Harvard Law School to prove to him that she is more than just a spoiled sorority girl. Along the way, Elle faces many obstacles, including Warner’s new girlfriend, acclimation to the world of law, and people who underestimate her; however, she also makes new friends, discovers her passions, and possibly develops feelings for another guy. Come watch the show to find out! As opening night gets closer, members of the Vista Murrieta High School Drama Department work hard to prepare themselves for their annual musical. The production is off to a great start, with a high-energy cast and a hard-working crew. "Rehearsals are going great," said Cory Finch, Vista Murrieta Drama Department teacher and the director. "We have a lot of enthusiasm – a lot of energy – as we’re putting together the vocals, the choreography, starting the blocking process, learning our characters. So it’s really exciting." VMHS’s Drama Club president, senior Cassidy Finch, will be playing the lead role of Elle Woods, a part that she has dreamed of for a long time. "The character has been one of my dream roles ever since I heard of the show for the first time in 2009," explained Cassidy Finch. "Her complexity, strength, passion, and love is really inspiring, and has inspired me personally to have more faith and confidence in myself." The entire cast is ecstatic about bringing this fun, high-energy show to life. "I’m excited to show the audience the positive energy and everything we’ve been working so hard on," said senior Sarah Bennett, who plays Margot. "It’s a really amazing show." 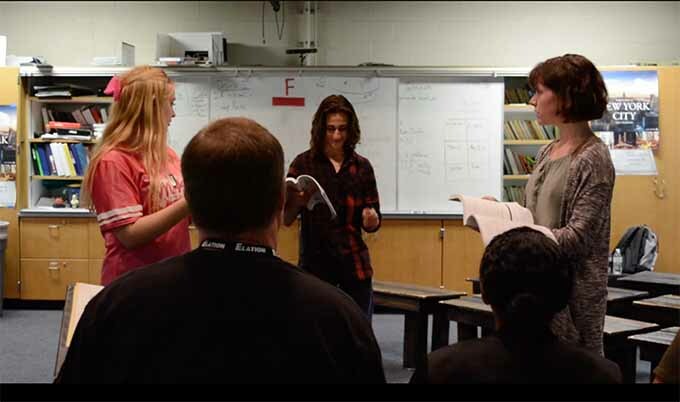 Students rehearse their lines for the upcoming production of "Legally Blonde the Musical". Every day after school, the cast and crew rehearse and put together all the production aspects. Not only do the students have to develop their characters and learn challenging choreography, but they also have to build their set and put together props and costumes. 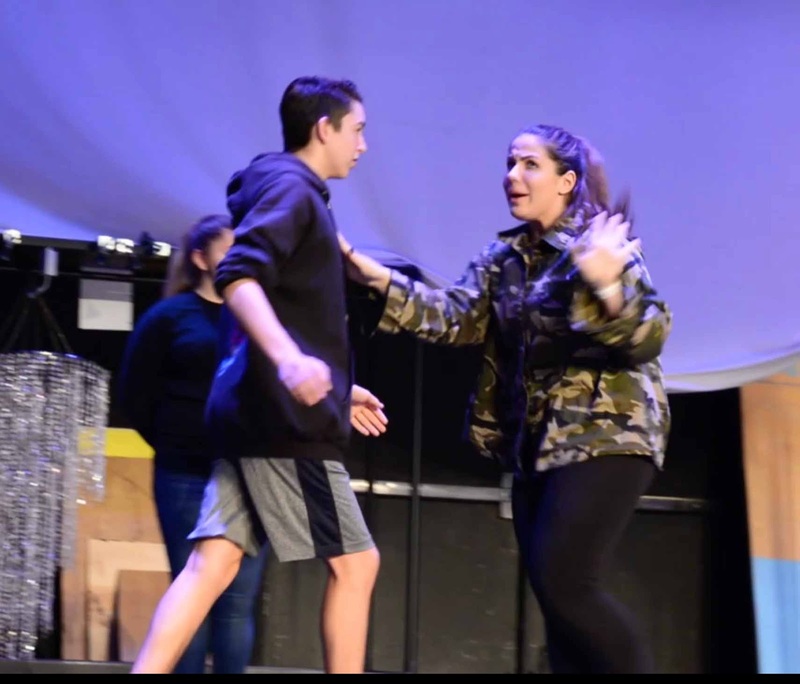 The show’s stage manager, senior Perri Sparano , says that the crew is "incredibly hard-working and I enjoy working with them every day." As for the show in its entirety, Sparano believes "it’s going to be a really really great show that everyone is going to want to see." 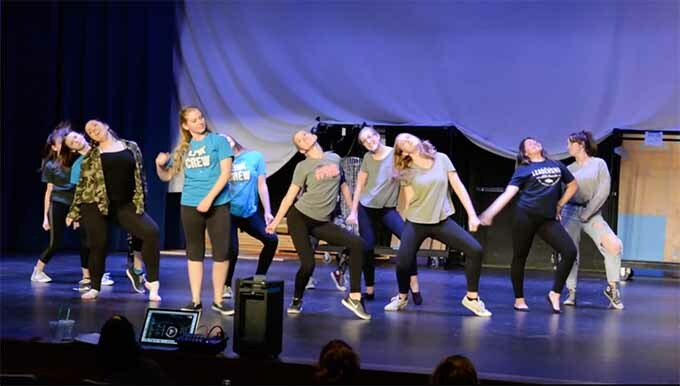 Vista Murrieta is not all talk, for over the years, the school has won many awards in several different categories, from ensemble to live music to lead roles to set design, and much more. In the 2017 MACY (Music and Art Commendations for Youth) Awards, award winners included Dylan Wager, Raquel Deporto, Cassidy Finch, Kailey Bosna, Jacob Rivera, Natalie Calderon, Colin Acda, Dani Arriberre, Annabella Cusimano, Jack Hutchens, Gavin Martin, Erin Lamay, Patrick Tuazon, Caleb Batchman, Kiara Harris, Robin Frieberg, Geoffrey Geogshegan, Andi Moring, and Sarah Bennett. The National Youth Arts also awarded VMHS’s production of "Almost, Maine" with Outstanding Ensemble to the cast and Outstanding Student Direction to students Cassidy Finch and Natalie Calderon. The NYA also awarded Outstanding Featured Actress in a Play to senior Kailey Bosna for her role as Sandrine in "Almost, Maine" and to senior Erin Lamay for her role as Glory in "Almost, Maine". The program has a lot of talent, and their efforts are being recognized by many people in the theater community. Not only is the VMHS Drama Department a group of talented, hard-working students, but they are also a theater family. Junior Iris Zietlow, who plays Serena in "Legally Blonde", is so happy to be "bonding with [her] fellow sorority sisters – or Delta Nus. [They’re] creating a real sisterhood, and [they] get to show that onstage." A lot of the crew and cast members have known each other for years – even since middle school – so creating such a close bond with one another is almost inevitable. The chemistry that you will see onstage is not fabricated, for the people in the VMHS Drama program call themselves a "theater family." The Vista Murrieta High School Drama Department hopes that you will come see their show. Not only is it local, but totally affordable – being only $8 for VMHS students with ASB card and $10 for General Admission. So invite all your family and friends to come watch and support the theater community. Whether you are looking for a new show in town, something to do with your friends, date night, or just a night out where you can have fun, "Legally Blonde" is the show for you. "[Our] biggest goal for show is to have the audience knowing that they got a quality show and that they leave happier than when they came," said Zietlow. 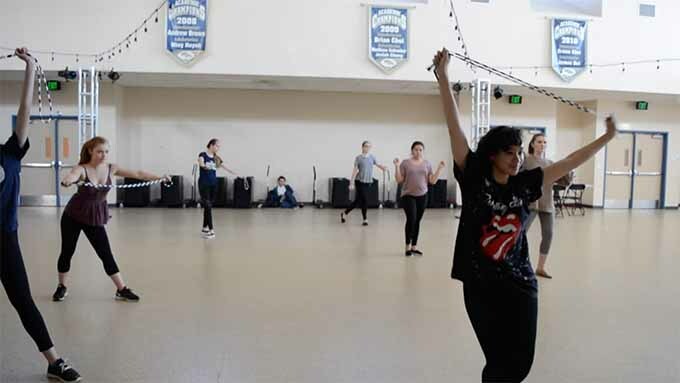 Vista Murrieta students practice choreography in preparation for their spring musical.